Quietness Is A Force Of Winning In The School Of Wisdom. 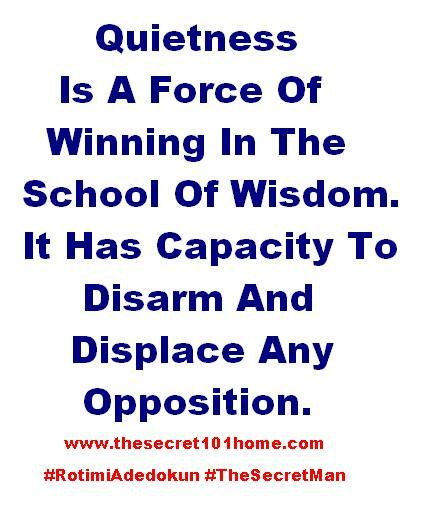 It Has Capacity To Disarm And Displace Any Opposition. It Is The Secret Of Transferring Issues To God. If You Are Not Alone, You Will Soon End Up Lonely. Quietness Is The Force Of Assurance That God Is In The Situation With You. Remember Peace Be Still And Be Still And Know That I Am God. He Who Has Knowledge Spares His Words And A Man Of Understanding Is Of A Calm Spirit. Sometimes A Fool Is Counted Wise When He Holds His Peace. Quietness Is Powerful, Embrace It. This entry was posted in Spirituality, The Secret, Vitamin Of The Mind, You! and tagged Bishop David Oyedepo On Quietness, Exodus 14:13-15, How To Be Quiet, Jim Rohn On Quietness, Pastor E A Adeboye On Quietness, Ps 46:10, Quietness, Rotimi Adedokun, The School Of Wisdom, The Secret Of Quietness. Bookmark the permalink.